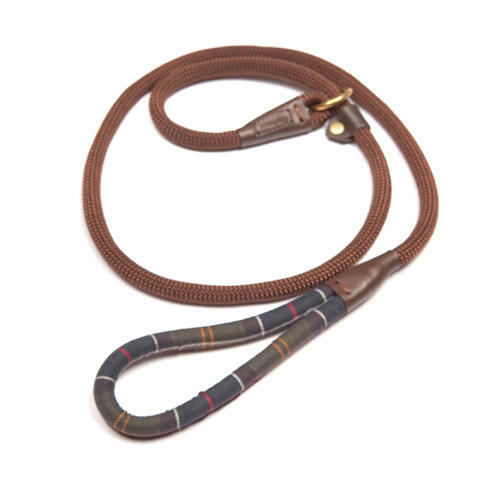 The Barbour Tartan Trimmed Slip Dog Lead is the perfect country accessory; stylish but robust. Your pooch will look the part on every walk. Barbour's Tartan Trimmed Slip Lead is the perfect country accessory. You can walk your dog with ease as the lead simply slips over the dogs head and is adjusted to fit, the lead provides a comfortable walk and once you're finished the lead simply slips off in the same fashion. The lead is presented in Barbour's classic tartan colouring including a grip section where one would rest one's hand. Barbour have branded the lead via an embossed leather Barbour badge. As the item is fully adjustable it would suit a variety of breeds however it is recommended that the maximum weight this lead could carry would be 50kg. Lead comes in one size.